Does the Cold Affect Your Car? Before the winter cold has a chance to negatively affect your car, take some time to prepare your vehicle for the long season ahead. Start your maintenance with these simple winter car care tips. It's safe to say your car probably isn't super fond of the winter. Not only are the roads more slick and dangerous, the colder conditions can also affect your car's wellbeing. From thicker fluids to reduced visibility, there are quite a few different issues to be prepared for. To help you and your car get ready for the winter, check out these tips from Advanced Filtration Technologies, Inc. 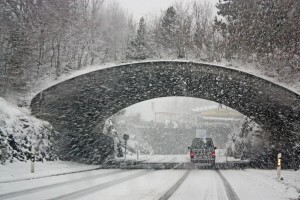 The winter can bring with it plenty of storms that can lead to a plethora of road issues. Wet, slick roads can make it harder to maneuver your car while falling snow and rain can make it harder to see the road ahead of you. As temperatures drop outdoors, it can be quite easy for your windshield to fog up and make it even harder for you to see the road as you drive. Luckily, this is easy to take care of with your defroster. That is, of course, if your defroster is working properly. Without it, you'll be left wiping down your windshield with your sweater or any other cloth-like object you have at reach. Not only is uncomfortable, it can also be quite dangerous. Prevent this by taking your car to get serviced before the winter storms arrive. The cold temperatures are known to cause tires to deflate seemingly on their own. Because of this, it's important that you make time to check on your tire pressure once a week. This may not seem like it's that important, but under-inflated tires can make maneuverability more tricky and can cause a reduction in traction. Staying on top of this can help ensure you have an easier time on the road. Check your tire pressure while filling up your tank so that you can make any adjustments before heading back out on the road. As temperatures drop, you may notice your car's fluids getting thicker and thicker. Although this isn't uncommon during the winter, it shouldn't be ignored. The thicker your fluids get, the slower they'll flow, and the less protection they'll offer your car. Use winter grade fluids to prevent this from happening. If you're concerned about your motor oil getting thick and sluggish, a synthetic oil change may be the perfect solution to the problem. Since synthetics oils are made to withstand extreme conditions, they have an easier time holding onto their properties. This means they won't get thick like conventional oil and will be better able to keep your engine protected no matter how cold it gets. If you're concerned about your motor oil not being able to perform well in the cold, it's definitely time for a synthetic oil change in Williston. Since a synthetic oil will keep your engine better protected than a conventional oil during the coldest months of the year, now is the perfect time to make the change. Contact Advanced Filtration Technologies, Inc at (701) 572- 3780 to find all the best AMSOIL Oil products, including their Signature Series 0W-40 Synthetic Motor Oil. Your windshield wiper blades are located outside of your car, leaving them exposed to not only the cold but also to the rain, snow, and everything else the winter can throw at them. Because of this, the rubber part of your wiper blades can dry up and become brittle. Wiper blades in this condition won't be able to keep your windshield clean meaning your visibility will be compromised, especially during a storm. Preventing this is quite easy and only requires that you change out your wiper blades for some winter blades that will resist the cold conditions better. Extreme temperatures, whether hot or cold, can take a toll on your car's battery. If your battery is already experiencing some trouble while trying to start, the cold can push it closer to its end. Since your engine will need more power to perform in the cold, this too can negatively affect your battery. Get a volt test done on it just to be sure it'll get you through the winer. It's also a good idea to carry jumper cables in your trunk just in case. Prepare your car to successfully take on the cold with a synthetic oil change in Williston, ND. Contact the synthetic oil pros at Advanced Filtration Technologies, Inc. by calling them at (701) 572- 3780. They can help you find all the products you need for your synthetic oil change.